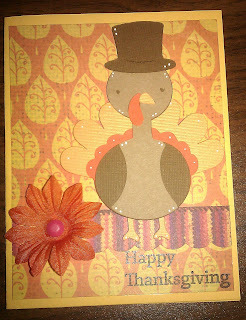 Made this card for CTO Challenge # 39 and here are the rules:The theme this week is "Thanksgiving (must use a punch)"!!!! This week Team #1 is showing their thankfulness!!! Create a project and post by Sunday, November 20th, 11:59PM (EST). Embelishments: Flower & Brad are both Recollections and White Gel Pen, EK Success Punch: I don't remember the name of the punch sorry. Great card! The turkey is super cute! Thanks for playing at CTO! Thanks for playing with us at CTO.. Thanks for joining us at CTO!